Have you been searching for the loudest Jobsite Radio? Here are the top 10 loudest portable jobsite radios on the market with Bluetooth that deliver some serious audio performance when it comes to thumping bass and volume output. These best jobsite radios feature some of the most powerful audio drivers ever engineered, pumping out tonnes of audio juice at extraordinary volumes with minimum distortion and with crystal clarity. They are also designed to be very versatile and rugged for use on any construction site. We were very impressed by the performance of them and we think you will. Our favorite jobsite radio is the Sangean U4 Ultra Rugged Digital Job Site Radio. It sounds better and plays louder than most of the competition, plus its portable and rugged design means you can take it with you anywhere you want – and it can survive almost any tough environment. ***NEW***: Loudest Bluetooth Speakers on the Market! One of the biggest questions we get asked when talking to folks about jobsite radio is: How do I pick out the loudest one? There are many factors that come into play here, including the output wattage of the radio, volume capacity and sound insulation. Generally, we look for jobsite radio with the best combination of output wattage, volume level and design to create the loudest sound. Our experts have tested each jobsite radio to ensure that they not only deliver the loudest sound, they have to provide really outstanding sound quality, too. Because without high-quality sound, high volume output doesn’t make any sense. These radios will be used on the jobsites, a portable/weather-resistant/dust-resistant/shock-resistant design is also a factor that comes into play. Another important factor that we looked at is the ability to stream music from smartphone and other Bluetooth devices. 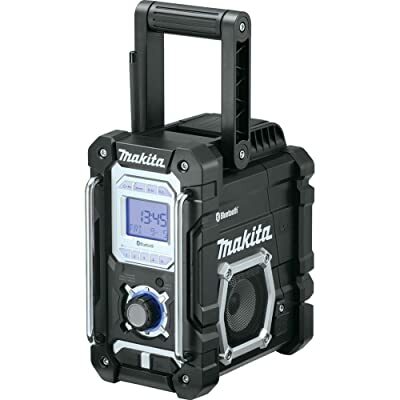 The best jobsite radios should be able to stream your favorite music from away, at least 20 feet. 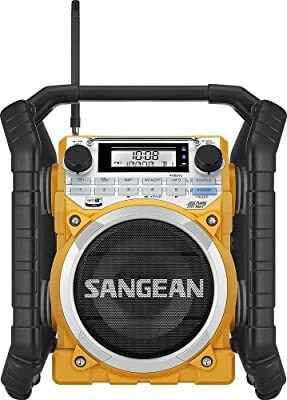 The Sangean U4 Ultra Rugged Digital Job Site Radio is the best sounding and loudest portable jobsite radio you can buy. It is the latest in a long-line of well-received jobsite radios from Sangean and seems to incorporate all of the latest technological advances and features available in a cool-looking, functional package. The Sangean U4 is a very compact unit. It’s small but provides all the features one would expect of such radios and even more, such as built-in AC power along with the ability to run on external 12 volts via a commonly available car power adapter, the ability to run on 6 standard or rechargeable D cells with a built-in charger. Other features include a large backlit LCD display, a protective roll cage, certified for Dustproof and Waterproof, a high-performance radio with FM, AM, and NOAA Weather bands. This jobsite radio is integrated with the latest Bluetooth technology allowing you to stream your favorite music from your phone up to 40 feets away. It’s powered by Qualcomm aptX audio – which enhances the wireless sound quality of the speakers. Previously, the speakers often had a reputation for providing average quality sound via Bluetooth, but with aptX, they can overcome that barrier and consistently deliver higher quality audio wirelessly. aptX is a key product differentiator in over 320 leading audio brands for headphones, headsets, automotive audio, speakers, mobile devices and gaming products—where the ability to have a true audiophile experience is paramount. The ION Audio Job Rocker Plus is specially designed to deliver vibrant, lifelike sound, so music sounds great and you hear every play of the big game clearly. With powerful 50-watt speaker system, it can produce really big sound and will literally shake the floor when blasting music. What’s more? This is not only one of the loudest jobsite radios available, it also has the longest battery life with a built-in battery that provides up to 50 hours of continuous use on a single charge. What’s a huge number! A built-in AM/FM radio with six presets and rubber antenna makes sure you never have to miss a game on the job. heavy-duty steel handles and protective corner bumpers mean you can stay focused on the job and not worry about damaging the radio. The ION Audio Job Rocker Plus certainly has a lot going for it. It is ideal for large job sites and outdoor areas where ruggedness and loud output are the most important criteria, and it is exceptionally flexible in terms of power sources and general convenience features. Dewalt has introduced many excellent rugged radios, and the DEWALT DCR025 Bluetooth Radio Charger is the loudest jobsite radio the company has ever made so far. 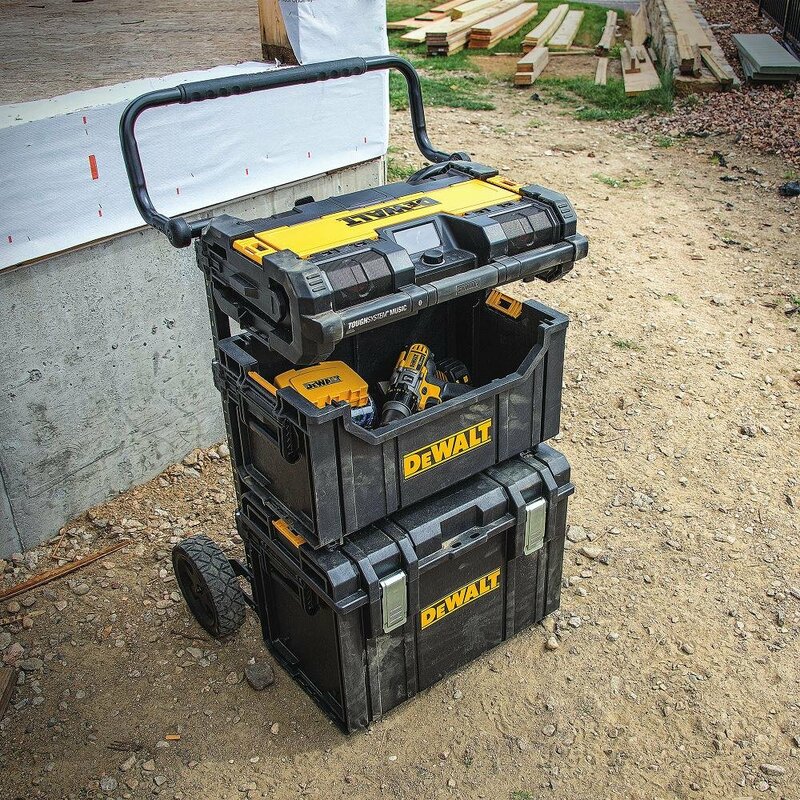 The unit is able to run off and charge DEWALT slide pack battery packs including 20V and FLEXVOLT packs at 3 AMPs when plugged into an AC outlet. So if you’re using Dewalt’s FlexVolt power tools, this radio is the one that you’ll never want to miss out. We were extremely impressed not only with the sound but by the design of this jobsite radio. The yellow-black design not only makes the speaker easier recognizable but also motivates workers to get the job done. The DCR025 runs on any DEWALT 20V MAX or 20/60V MAX Flexvolt battery or on AC power. Consistent with any battery powered radio/charger, play time depends on the amp-hour of the battery you use and the volume at which you listen. With the sound level set at 10 of 30 on the volume scale, we were able to get over 36 hours of play time on a single 4.0 Ah battery charge. It takes just over an hour to recharge a 4.0Ah battery. The DCR025 claims “stream music from any Bluetooth devices up to 100 feet away”. We tested and able to get line-of-sight connectivity between the radio and our phone at over 150 feet. As long as we held the phone still, the radio seemed to perform just like the phone was sitting right next to it. 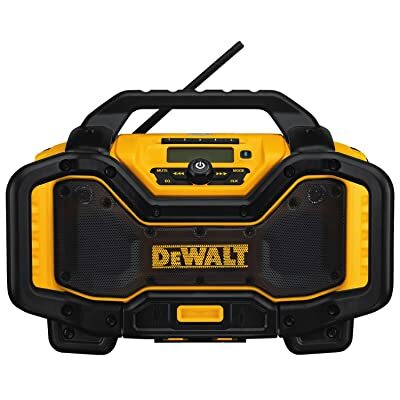 Overall, the Dewalt DCR025 provides good value in a Bluetooth charger radio – the roll cage design offers a fair degree of protection, battery recharge time is good, play time is excellent (with a 4Ah battery), and sound output is great. It’s definitely one of the best loudest jobsite radios for most people. This is the best-looking jobsite radio we’ve ever seen. 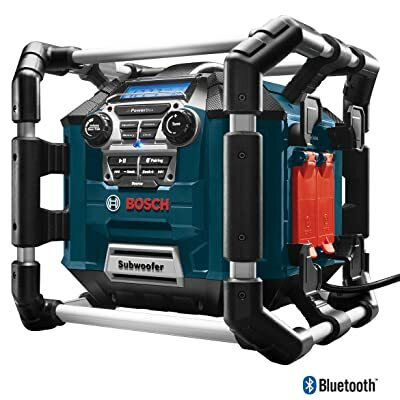 The Bosch PB360C Power Box Jobsite Radio is not only one of the leading products from Bosch, it’s also one of the loudest jobsite radios that has the farthest Bluetooth range, up to 150 to 200 feet. The bass response that we got out of this jobsite radio is powerful enough to shake an entire room when cranked up to maximum volume. With 4-way speakers and a subwoofer, it delivers 360-degree enriched stereo sound. We must say the Bosch PB360C is the best speaker for Rock music. You can control your music through a specific app. With this app, you can play music, set an alarm, record a message on your phone and play it through your speakers. Like the Dewalt, besides this Power Box being a radio and media player, it is also a charger. When you have the unit plugged in, you can not only charge your Bosch batteries, but also your cell phone or other electronic devices such as an iPad. On the back of the radio is where you can insert your Bosch battery (18V or 14.4V slide packs). When you plug in the unit, it will automatically start to charge your battery or whatever is on the USB port. As soon as you unplug the box, it will kick right over to using the battery as a power source without any interruption. Overall, with such a lot of great features, the Bosch PB360C is one of the best jobsite radios you can buy and we highly recommend them. The Rockville Rjs8 is engineered to be the loudest portable jobsite radio on the market. With 200 watts peak power and 100 watts RMS power, this is actually one of the most powerful speakers at this price point. 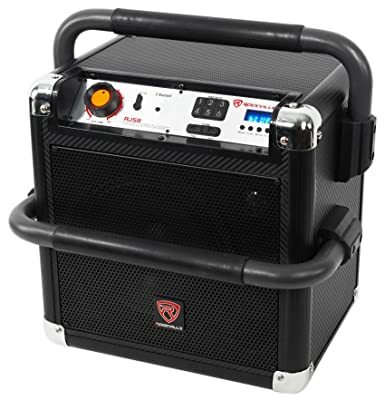 If you are on the jobsite or tailgating and turn this speaker up you will be able to hear it from 300 feet away. And the built-in Bluetooth will allow you to playback music from your smartphone or other Bluetooth devices from 65 feet away. The unit itself is built like a tank and is dust and water-resistant. 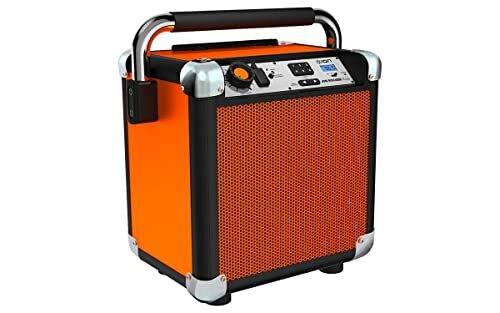 It has 2 solid metal handles, one at the top for ease of carrying and one in the front that prevents the speaker from being damaged if the unit tips over. It also features USB ports, built-in SD card, AM/FM PLL Radio Tuner with auto scan and AM/FM loop antenna, and 10 Memory preset radio stations. The sound quality isn’t as good as 4 models above but at this price point, the Rockville Rjs8 exceeds all our expectations. 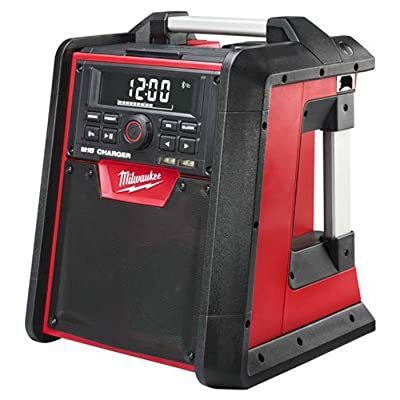 The Milwaukee 2792-20 M18 Jobsite Radio is a heavy-duty jobsite radio and is a big improvement from the previous model – the Milwaukee 2790-20. It’s not only one of the loudest jobsite radios to buy, it’s also one of the best battery chargers for M18 batteries and most electronic devices such as smartphones or tablets. We love the fact that the 2792-20 has a unique charging technology that is able to charge batteries 50% faster than most competitors. With the Bluetooth receiver, you can stream rich, full sound wirelessly from over 100 ft. Milwaukee used an older Bluetooth profile, so the connectivity uses a 4-digit pin, but since you only have to enter it once to pair a device, it wasn’t much of a hassle. The speaker sounds extremely good and clear. It’s a great radio that doesn’t color the sound too much and distortion is only an issue if you’re determined to run it at absolute full volume. Keep it just under the max and it will put out lots of loud, clean music that sounds good and fills up even the largest of job sites. The Milwaukee 2792-20 has a lightweight, portable and rugged design. It has a reinforced roll cage to protect against weather and harsh conditions, while the large, onboard weather-sealed storage compartment protects small belongings and smartphones. The Makita XRM04B Jobsite Radio is one of the loudest jobsite radios from Makita. We were very impressed by its compact design. It weighs only 10.4 pounds with battery and looks pretty small. It features an auxiliary port that’s compatible with most MP3 players so you can hook them up or use Bluetooth technology to listen to your own music wirelessly. A built-in USB port allows you to easily charge your mobile devices. You’ll enjoy high-quality stereo sound with the two 3.5-inch side-firing speakers. This jobsite radio has menu options to choose FM stations, time and clock settings, volume and snooze. It’s also water resistant and has protective bumpers to stand up to tough conditions. When powered by Makita 18V LXT Lithium-ion batteries, it gives you up to 20 hours of run time, up to 6 hours when using a compact Lithium-ion battery. Overall, we think the Makita XRM04B is a great choice for anyone looking for a small jobsite radio but delivers outstanding sounding output. Even though the Bluetooth range isn’t very far (approx. 30 feet), it’s still a very good radio for use on the jobsite. If you are looking for a job-site radio that has premium sound quality, possibly the best out there at this time, look no further. The Dewalt DWST08810 ToughSystem Music Player with Charger has the sound quality that will satisfy almost any user. With 4 Full Range Tweeters on top for all around sound, an active and passive subwoofer on the bottom for good base, and an Assisted Bass Resonator, this unit will be a great travel partner kicking out excellent sound. With “ToughSystem” in the name, it’s a dead giveaway that the DeWalt ToughSystem Music + Charger is part of the DeWalt ToughSystem storage solutions family. It is fully capable of locking in as the top portion of any ToughSystem storage box or group. Combined with the rolling cart, you can keep your gear organized and get it to where you need to work with just one trip from the truck. The Dewalt DWST08810 is not only designed to be one of the best loudest jobsite radios in the industry, it’s also engineered to charge any Dewalt’s 12V and 20V battery. The battery charger is rated as a 1A output and will take 90 to 300 minutes to charge your battery. When using a 20 volt, 2 Ah battery to power the radio, you can run it all day (8 hours).